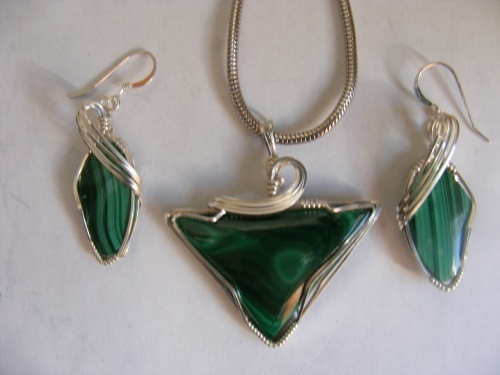 This gorgeous Malachite gemstone set is wrapped in sterling silver swirls. Beautiful Malachite is said to be a powerful gemstone said to enhance intuition. Pieces have beautiful light and dark bands of greens. Pendant measures 1 7/8" long by 1 5/8" wide, earrings measure 1 3/8"long and 5/8" wide. Pendant comes with a sterling silver snake chain.